The 3 wheel rollator is a type of walker which offers walking assistance to many individuals. The 3 wheeler is designed similarly to a standard walker, but it does not have a seat that allows for sitting down occasionally. 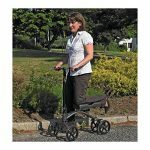 These walkers suit people who need some balance support but don’t need the full support offered by a 4 wheel rollator walker. There are four basic styles of rollators: 3 wheel, 4 wheel, heavy duty and a combo of the rollator and a wheelchair. The 3 wheel rollator with seat has some specific benefits. The 3 wheel rollator is a good option for those who need slight assistance with mobility. 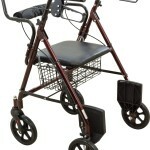 They are easier to use than the traditional lift and push step walkers as they can be difficult to handle. 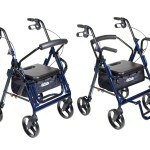 The rollator has wheels which allow them to move along with ease while the individual walks along behind the unit. By design, the rollator is light and portable so that they are convenient to take along on outings. Which is better, a 3 wheel rollator or a 4 wheeler? Rollators are usually available in either a 3 wheel or 4 wheel model. The basic rule of thumb is, the larger the wheels, the easier a unit is to push. This is particularly true when traversing over rougher terrain. It is important to note that rollators with small, solid wheels are more suited for indoor use. Each style has its own benefits but there are distinct benefits to using a 3 wheel rollator. The 3 wheel models are slightly smaller than 4 wheelers, which makes them easier to maneuver. They are usually slightly smaller than the 4 wheel units so they are easier to handle in small spaces. There are also a number of accessories that can be purchased. These are not necessary but can be very useful. 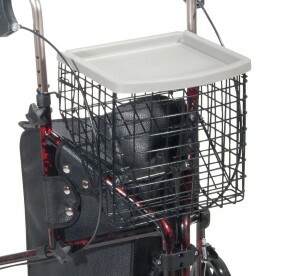 Optional accessories include things like holders for oxygen bottles, baskets or bags, and a cane holder. There are several popular 3 wheel rollater models on the market. Each rollater walker has its own benefit and features that make it stand out. Here are three popular models. The Drive Medical Winnie Light Supreme Aluminum 3 Wheel Rollator is definitely the most popular 3 wheel rollator on Amazon. It is available in three choices: Flame Red, Flame Blue and Tan Plaid and weighs just 11lbs. 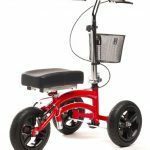 This 3 wheel rollator features solid 7.5 inch wheels with spokes for additional strength and is a sturdy walker which will handle indoor and outdoor use and a variety of surfaces with ease. The tires are soft grip tires. The durable and lightweight aluminum frame is designed to make this unit easy to transport in and out of cars and the public service as you can fold it up with one hand. The handles feature a ergonomic hand grip for a comfortable grip and loop locking brakes ensure safety as soon as you brake. The handles on the Drive Medical Winnie 3 Wheel Rollator are adjustable to suit various heights and lock with a self threading knob. The handle height adjusts from 32 inches to 38 inches. 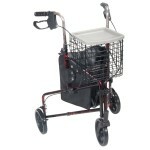 The Nova Medical Products Traveler 3 Wheel Rollator is an extremely lightweight, 3 wheel walker as it weighs only 15 lbs. This makes it veery easy to transport in and out of cars and public transport. The 3 wheel aspect gives you great maneuverability in tight places where there may not be a lot of room to move. This is a definite benefit over a four wheel rollator walker. 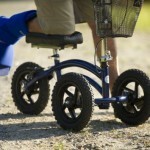 8 inch wheels provide a smooth ride over rougher terrain such as grass, pebbles or dirt paths. Locking handbrake's provide comfort and safety when you need to stop suddenly. 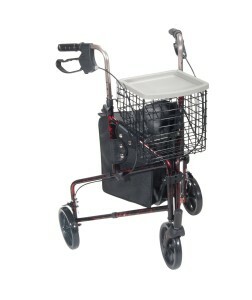 This 3 wheel rollator with seat includes a tray, a basket as well is a pouch to store your personal items in. The colour range offers blue, black and red. Adjustable handles from 30.25 in. to 35.25 in. The Drive Medical 3 Wheel Rollator in either Flame Red or Flame Blue is one of the more popular models available on Amazon with a weight capacity of 300 lbs. Large 7.5 inch castors offer easy manoeuvrability both indoors and outdoors with the ability to travel easily over rough terrain. The wheels are reinforced with spokes traditional strength. The wheels can be locked with a special loop lock made of aluminum ensuring safety. The handles are height adjustable and lock with a self threading knob. They will adjust from 31 inches to 38 inches high. 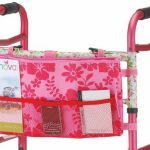 A large shopping basket which conveniently folds for storage, along with a pouch and the tray is included with the Drive Medical 3 Wheel Rollator. These three have similar features including adjustable handles and easily foldable. Some include useful accessories like baskets, trays or a pouch. They are all relatively lightweight and easily transported. All three are similar in that they help improve mobility for those who need assistance walking. The carrying pouches or trays are useful but not necessary. It’s important to note if there is a weight limit and to adhere to this for safety purposes. The handles are usually adjustable so that they are easily changed to the proper height for the user. The Supreme Aluminum 3 wheel rollator with seat is extremely lightweight which might be a factor to consider during the purchasing process.